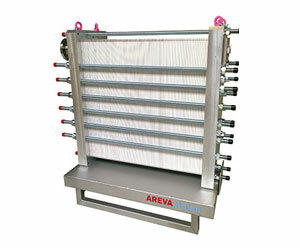 AREVA H2Gen, the French leader for electrolysis, manufactures Proton Exchange Membrane electrolysers. Hydrogen is produced from water and electricity preferably originating from the production of renewable energy (solar and wind). Our markets are foremost in the sectors of services to the grids, clean mobility (vehicles running on hydrogen batteries) and industrial usages. AREVA H2Gen has revealed this year its innovating concept for a large capacity electrolysis plant (60 MW). We have also presented a 1 MW “stack”, the core of the technology. 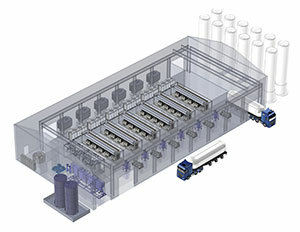 This type of electrolysis plant using PEM (Proton Exchange Membrane) technology will serve several international markets, among which industry. The 60 MW plant will produce hydrogen for industrial applications such as used in the petrochemical industry. This plant concept is also essential for the “Power to Gas”, i.e. the valorisation of renewable energy, for which part of the production is currently lost. As the only French manufacturer of electrolysers, AREVA H2Gen aims to address an international market which is growing rapidly. As an industrial manufacturer, the company also provides project engineering.